45 years ago today NASA was taking its very first steps – literally, through the feet…or rather, the entire body, of the first American spacewalker: Ed White. It would have been difficult, except through hindsight, to believe that the space program would progress from these baby steps to “a giant leap for mankind” within five years. And here I am, 45 years later, wondering what happened to make America lose sight of those beginnings; the beginnings that were supposed to lead to continuance. Much like Mr. White I am getting my feet wet, not in the void of space (yet!) but in the pond of adulthood. I am taking those baby steps of moving away, living on my own and paying bills; I am slowly learning how to walk in the ways of flight test engineering, test plans, and briefings; I am building the muscle strength to accomplish my dreams. So far I have dedicated nearly 2 decades of my life to science, engineering, and space; but for what? A step backwards in manned space flight? So the “me” generation can have all their fancy cell phones, laptops, blackberries and blueberries? So we can focus on “U.S.”, but really just on “us”? We have become such a self-centered nation, a complete 180 from the United States 45 years ago. 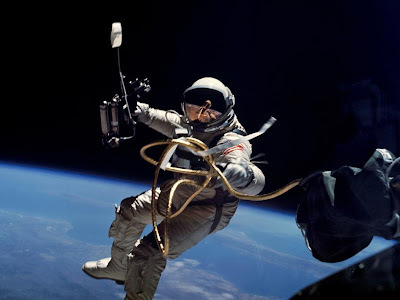 Americans today want the internet on their cell phones instead of an astronaut in space. And while it may “feel good” right now to this generation of giveme-giveme-giveme, where will we be another 45 years from now? Will anyone remember what a spacewalk is? Will kids growing up even want to be astronauts anymore? Will they even know what an astronaut is? Here we are, one of the most powerful nations on Earth, 45 years after getting our feet wet in the void of space, retracting our progress and in a sense, forgetting those precious spacewalking-moonlanding dreams altogether. No, Mr. White, I will not forget your first few steps into space and the incredible symbol of progress and intellect those steps represented.